The poster for our next concert is a little different from normal. I love creating event posters but I’m not a trained graphic designer and I’m aware I can easily fall into using certain familiar styles and layouts. When it comes to classical music concerts, it’s tempting to go with something that will be instantly recognisable as a poster for another classical concert. The whole point of a poster of course is to be eyecatching – but not just that, it needs to catch the eye of the people most likely to buy. I’d be kidding myself if I said that was a young, alternative kind of crowd. It ain’t. So best to go with ultra-safe, same-old…? Well perhaps. When I started thinking about the music we’re performing, yes, each piece is more-or-less on a religious theme, and we’re singing in a church, BUT the last thing I want to do is to suggest it’s somehow church music or traditional, or stuffy, or old fashioned, or whatever people might think who don’t know the music at all and just see the poster and the names of the pieces we’re performing. All three pieces are varied and exciting, and great examples of 20th century music. 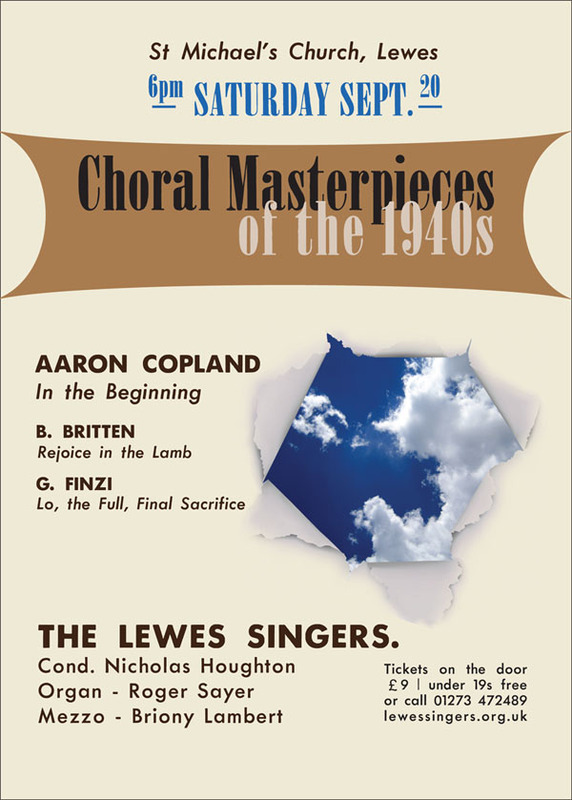 They were all written either during or just after the second world war, two of the composers are English (Finzi & Britten) and Copland was American. The Copland piece in particular is extraordinary, featuring a brilliant mezzo-soprano soloist who acts as a kind of narrator of the creation story. There are moments of both fireworks and tenderness, and everything in between. I began trawling Google images for inspiration in 1940s posters. I wanted our poster to say something about the american-ness of the Copland piece, and the emotional and spiritual range of the music, with a nod to the story of the creation. I wanted it to be exuberant but not trashy, startling but not solemn and fun but not flippant. The colours I chose are reminiscent of the period, when off-white or cream backgrounds were more common than white. The text is deliberately brown rather than black, less funereal and more earthy. The date is the only text in blue, to stand out, and the blue comes from the photo of the sky, which is glimpsed through a torn ‘window’, as if someone has punched a hole in it. I found a 1940s American typeface called Payson from a company called Walden Fonts who specialise in vintage American poster fonts, and combined it with the practice of using full stops in certain positions. The other typeface is Epsom. My only reservation is the date and time are a little small, relative to the month and day, but that was a stylistic thing I copied directly from another poster and really liked the period feel of the raised numerals with a line underneath. Whether it’s quite eye-catching enough for the target audience I’m not sure, but I’m hoping it’s different enough to make people look.